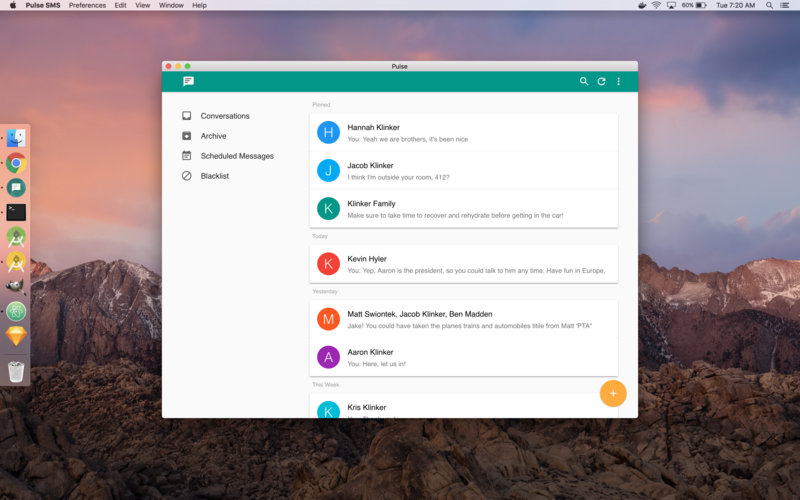 I am excited to release the initial desktop clients for Pulse SMS! These clients are now live for all your favorite systems - with support for MacOS, Windows, and Linux-based desktops. I know that this is something users have been looking forward to for awhile. Finally, I am comfortable with the level of polish and support that they provide, to release them to the public. After it is done downloading it, simply open it and install it like you would any other Mac application: by dragging it to the Applications folder in the window that comes up. This will install just like any other application, when you open the .exe file. I assume, if you are on Linux, you will know how to install the correct package. Sending and receiving messages will work the same as the web client currently does. If you enjoy the web interface and it works well for you, then the native apps will work the same way. Notifications: these are on by default, for all platforms. If you want to turn them off, hit the Preferences option in the menu at the top of the screen, and uncheck the Show Notifications preference. Auto Updates: all the variants come with auto-update support and will prompt you when a new release is available. They will be automatically downloaded and installed for you. Once it is installed, Pulse will act just like any other app on your system of choice. You can pin it to the dock, let it run in the background (for notifications), go full screen, or anything else you would expect. These clients are very similar to the Chrome App that has always been available for Pulse. The key difference is how the notifications are managed. The Chrome app was able to receive push notifications through Google's Firebase system (this is also how your Android devices communicate with each other). These native apps use the same web technologies that made the instant updates possible, on the web app. Enjoy the new apps and let me know if you have any questions, or you see any issues. These have been a long time coming and I am happy to get them out the door. You can sign up for a Pulse online account from the top option in the navigation drawer, Text from any device. Then, just download and log in to the desktop client and you will be set!